Window Garden Organic Tomato Grow Kit - Easy To Grow Vegetable Seed Kit, Includes a 10 Cavity Mini Greenhouse, SpongEase Seed Starters and Non GMO Organic Seeds. EASY AND CONVENIENT - Complete with everything you need, even detailed growing instructions, fits on your windowsill or better yet on a Window Garden Veg Ledge. SAVES MONEY - Don't buy expensive grown tomato plants at the nursery. 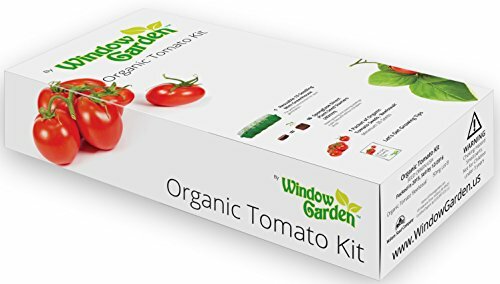 The Window Garden organic tomato grow kit comes with everything you need to start your tomatoes by seed on your home windowsill. SUCCESSFUL SEED GERMINATION - Includes a high quality and reusable mini greenhouse, creates the perfect environment for Non GMO Organic Seeds to Germinate. SUCCESSFUL TRANSPLANTING - Includes SpongEase direct plant seed starters. Expand them with water, sow seed in them then once grown, just plant into a planter or your garden. GREAT GARDEN GIFT - Impressive to give to anyone, from the packaging to the detailed instructions, it's sure to WOW. Perfect for getting kids involved in growing food. It's proven that our mental and physical health can be dramatically improved by adding plants to our environment. But many people are apprehensive about growing plants either because they lack the knowledge, time or claim "brown thumb". No more excuses! We've designed each Window Garden product with you in mind, all our products are complete and simple to use with detailed instructions. Easy to grow vegetable seed kit complete with non GMO organic seeds. The Window Garden Organic Tomato Grow Kit is easy, convenient and designed for success for any skill level. Don't buy expensive plants at the nursery, grow them by seed and save! Great for all ages, get kids involved in growing nutritious organic food. Easy to follow and informative growing instructions with quality components make it easy to start your garden by seed. No need to buy different products like seeds or messy growing medium. When your seedlings are grown, just plant them directly into a planter or in your garden. Mini Greenhouse- Seeds need constant moisture to germinate, the sealed lid and clear top ensures moisture and success. Spongease Direct Plant Seed Starters - Seedlings form stronger roots than those grown in traditional seed starting containers due to increased oxygen to the roots. This air exchange also "air-prunes" the roots, resulting in a denser root system. Plants are established quickly because you plant them directly into your garden or planter without the usual transplant shock from yanking roots out of a seed starting container. OUTSTANDING VALUE!!! The Mini Greenhouse is high quality and durable so you can use it again and again. Impressive Organic Tomato Grow Kit with premium packaging, graphics and instructions make it a great garden gift for anyone or any occasion. Contains: 1 Ten Cavity Mini Greenhouse, 10 SpongEase Seed Starters, organic non GMO tomato seed with complete instructions and growing information.